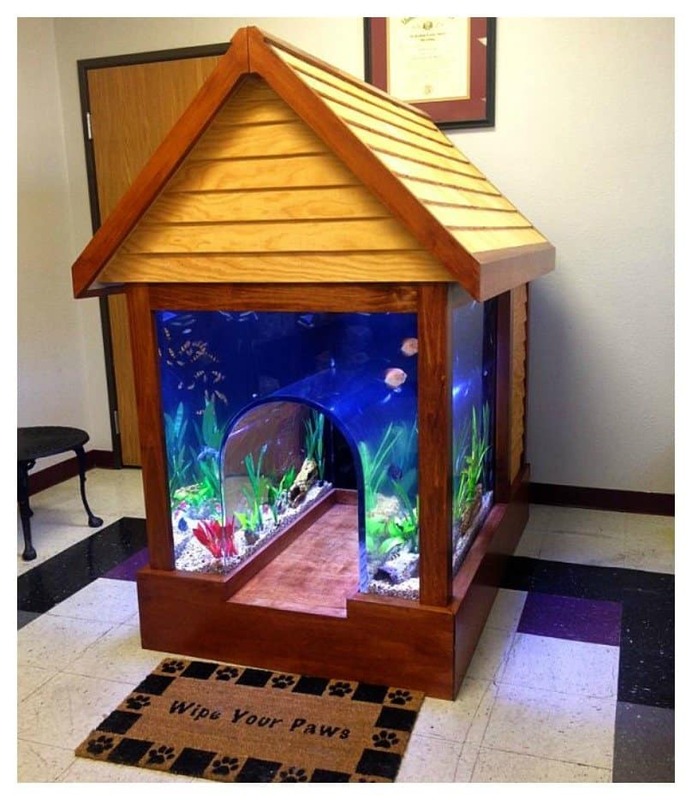 ﻿15 Cool Fish Tanks You Wish You Had! Studies show that fish tanks, fishbowls and aquariums are not just pretty objects used to enhance decor. There are actually therapeutic benefits to be derived from owning a fish tank, whether its at home or in the office. Watching fish go about their daily business is not only relaxing, but it can also help to reduce stress levels and lower blood pressure. And, if you are someone who likes to think outside the box, you should keep that mindset when looking for a fish tank; here are 15 cool options to choose from. 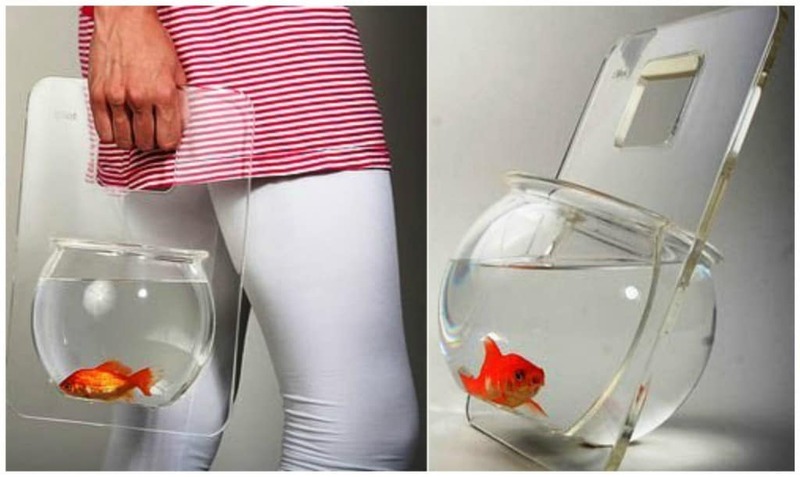 Why leave your pet fish at home when you can carry them around in your super stylish backpack fish-tank. Designer Cassandra Verity Green made this unique creation as part of her ‘Neptune’s Daughter‘ collection. 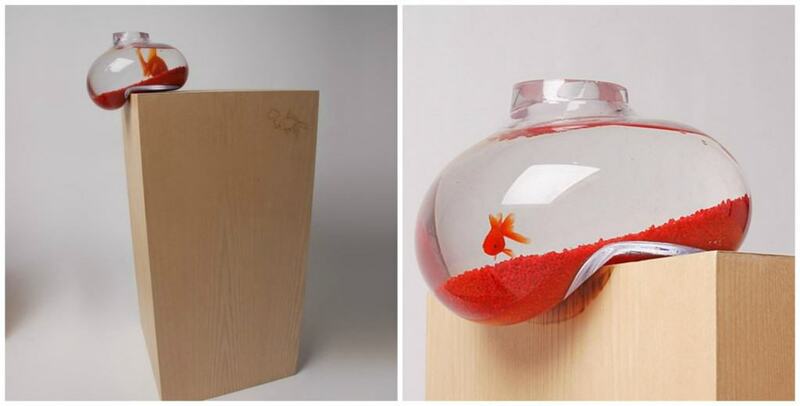 Don’t worry, this fishbowl is not about to topple over, it just looks that way due to the clever handmade design. This one was created by glass blower, Richard Bell and certainly ranks as one of the coolest we’ve ever seen. This amazing duplex doubles as a fish tank and a birdcage; the fish swims around at the top while the bird is free to fly around in its cage below. It was created by Constance Guisset and is thermoformed to create a space where the bird can fly at the same visual level as the fish. The wearer of this shoe literally holds the fish’s life in his hands, or well, in his feet. We’re hoping this is just for show and isn’t actually worn, what if something pierces the shoe? Poor little fishy! 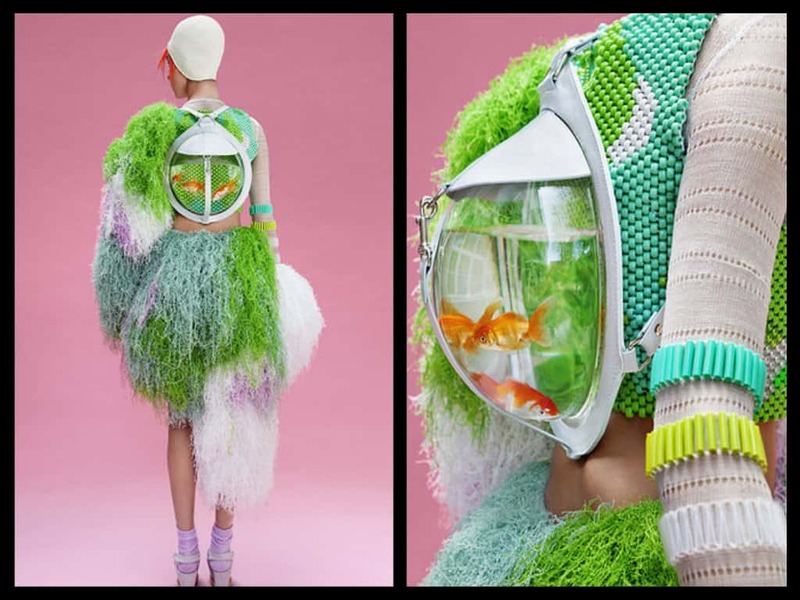 If you’re not the backpack type, then opt for this handbag fish tank. Hey, if you can walk your dog, you should be able to walk your fish! 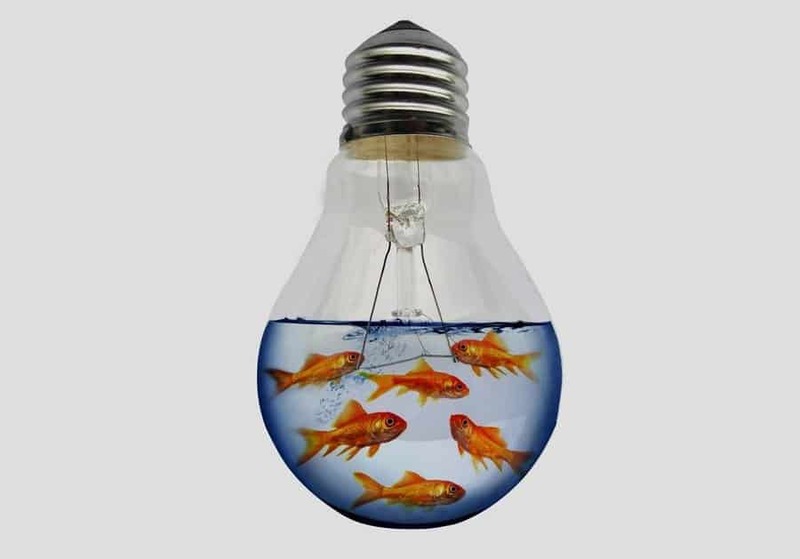 Have you ever wondered if you could put fish in a light bulb? Well, someone did, and they came up with this result. Let’s just hope they don’t screw it in and turn it on. Artist Dean Zeus Coleman is known for reinterpreting traditional art forms. 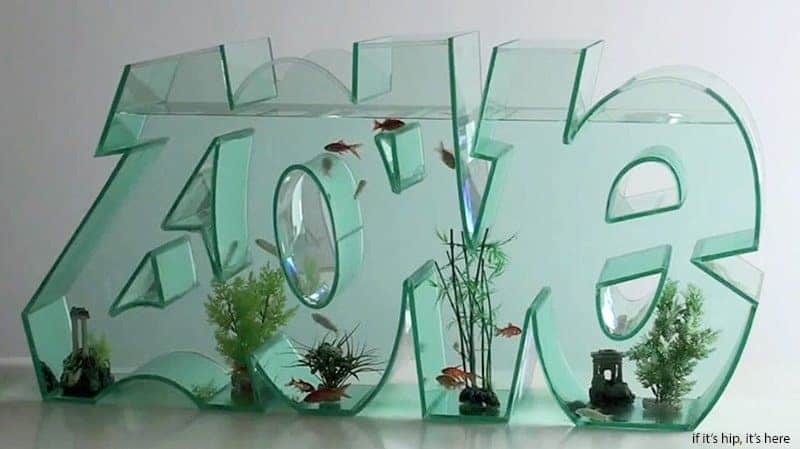 This time around he created the three dimensional graffiti, typography fish tank. These are often specially made for clients and the typography can differ based on what the customer requests. 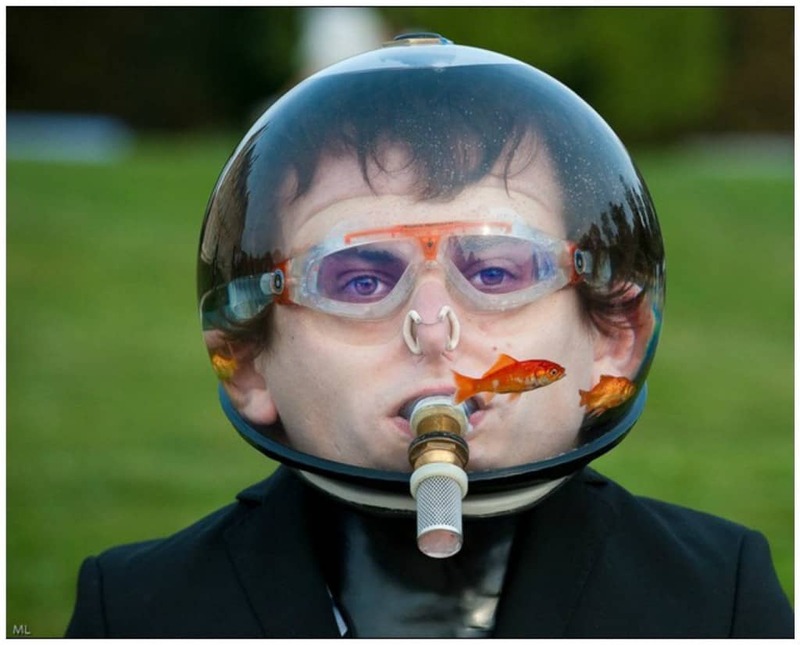 We’re not sure why anyone would walk around with a fish tank on their head, but this guy seems to think it’s perfectly normal. We’re guessing that he’s not claustrophobic, has no fear of drowning and isn’t prone to sea sickness — good for him. 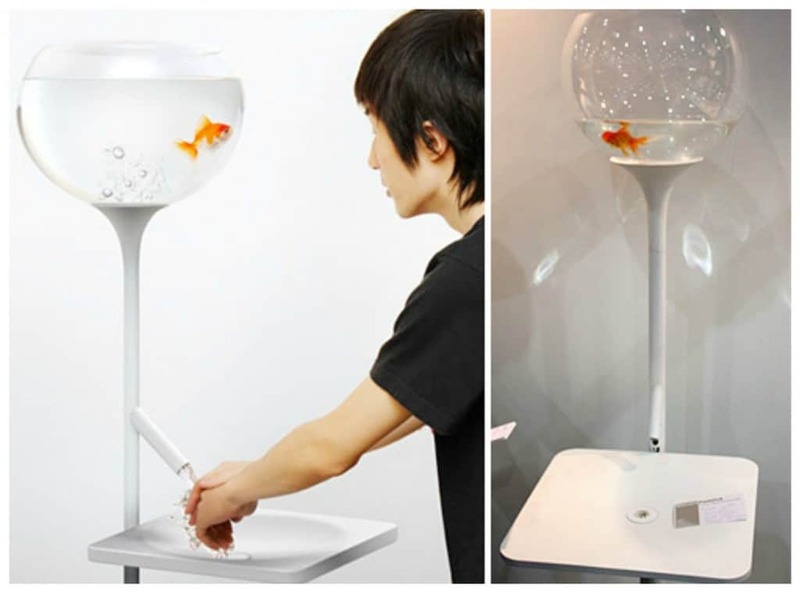 Known as the “poor little fish basin” this one was created by designer Yan Lu to encourage water conservation. When the faucet is turned on, the water level in the fishbowl decreases. If you use too much and the water runs out of the fish tank, well you know what happens to the poor little fish. Sad right? Actually, the fish is never really in danger; thanks to cleverly hidden plumbing in the base of the sink, the water that comes out of the faucet doesn’t actually come from the fish tank, nor will it ever drain out completely. Once the pipe shuts off, the water in the bowl slowly refills. 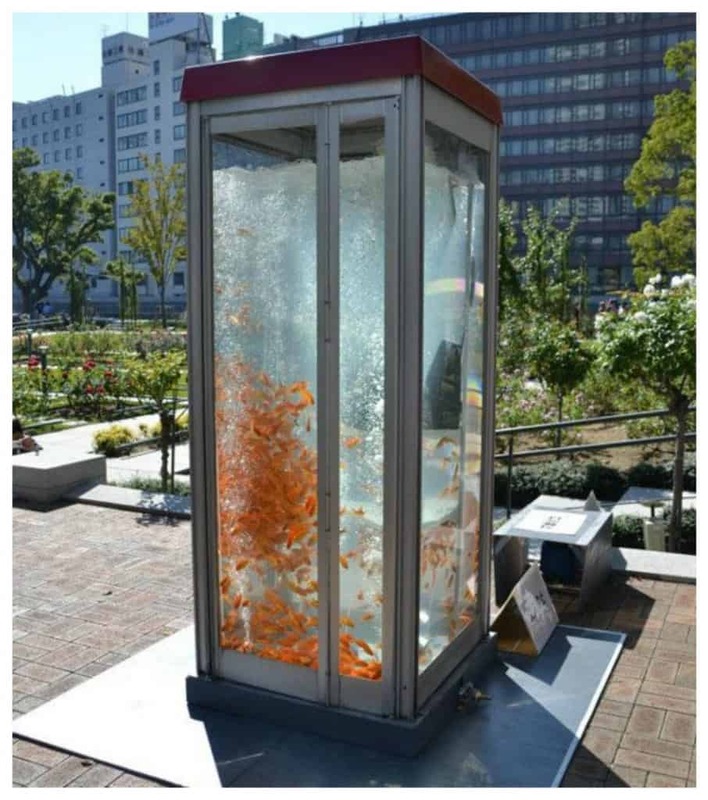 During the ‘Lyon Festival’ in France, Benoit Deseille and Benedetto Bufalino transformed a regular telephone booth into a functioning aquarium. Hello little fish, can you hear me now? Someone came up with the idea to let the iPod double as both a music speaker and a tiny aquarium, and called it the iPond. This sparked outrage, however, as the iPond was 15 times smaller than the recommended tank size for the fish it contained. The Royal Society for Cruelty to Animals (RSPCA) called on the device to be banned claiming it was too small to provide fish with adequate oxygen supplies and a clean environment. 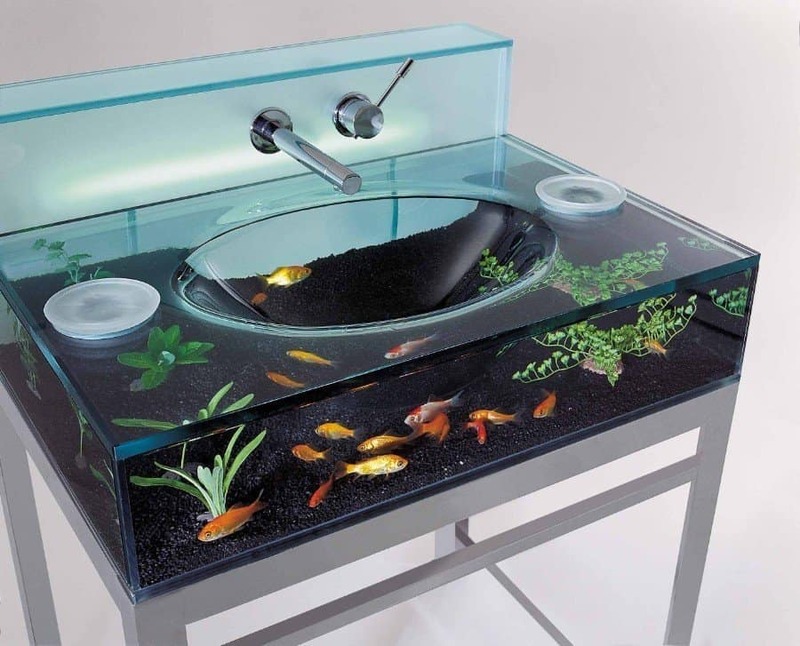 This aquatic bathroom sink does not come cheap. It is made from glass and chrome fixtures and comes equipped with water pump, water filter and soft lighting. For $4,500 this could be yours. Here’s a fun one for you music lovers. 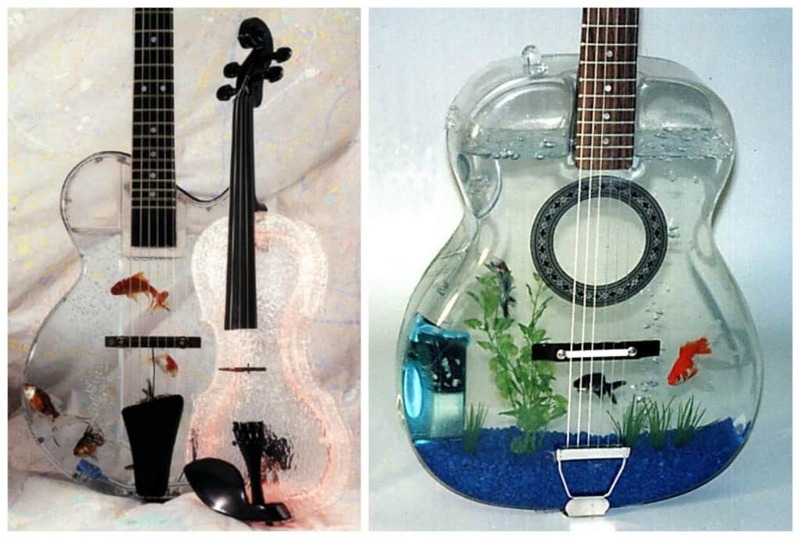 What better way to relax than to play some rocking tunes on the ole fish tank guitar! Honestly, we don’t know if dogs like fish, but we sure hope so because somewhere in the world, at least one dog is with the fishes. Nothing good is ever on TV anyway. 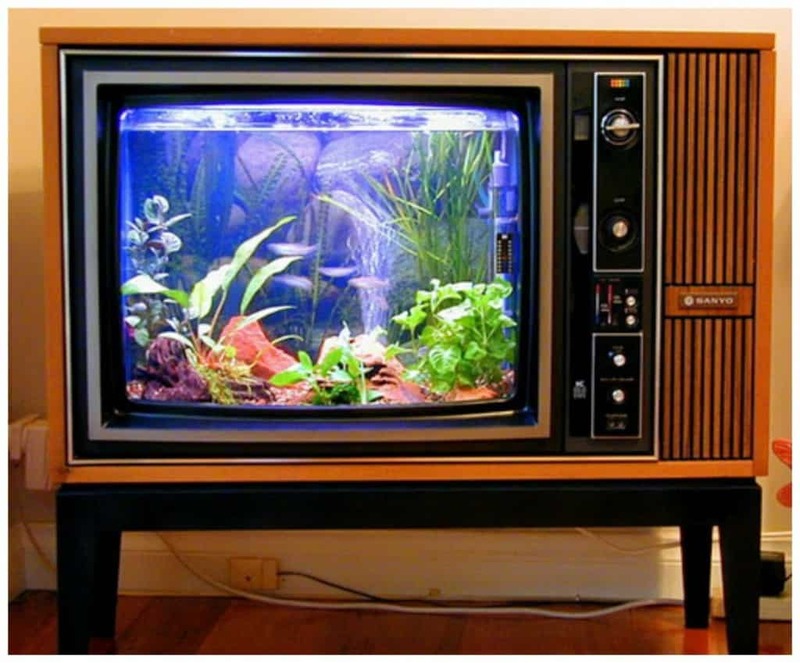 So, instead of paying for costly cable channels, why not opt for a cool TV aquarium.